A city planner of a new town had a radical idea. 'Streets' he said, cost money, take time to build, cause pollution, and are ugly, so let's build a city without them! 'Hmm' the radical thinker thought for a minute. 'Got it! Let's put everyone in the city in one big building!' He leaned back in his chair with his hands behind his head and a smile on his face. Most of the other planners were convinced, and suitably impressed with his cleverness, but there were still a few dissenters. The dissenters tried to find some flaw in his logic, but it was impeccable, so the smallest metropolis in the world was built. 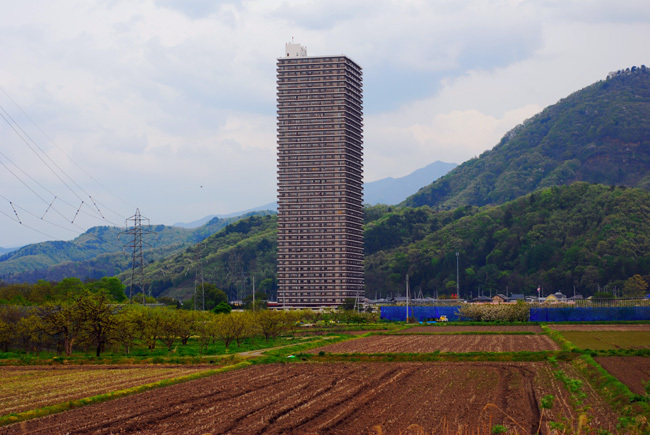 Sitting in the middle of nowhere, Fukushima (correction: the building is actually in Yamagata), surrounded by picturesque mountains and fields, one can only wonder what the occupancy rate is. At 41 floors, it's taller than most buildings in Tokyo.